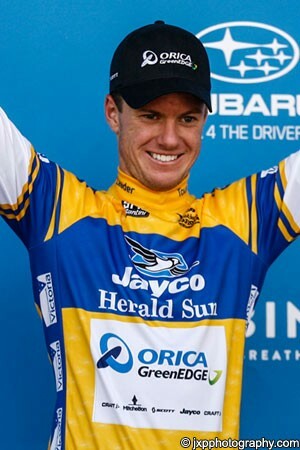 The 2012 Vuelta a España stage winner and King of the Mountains Simon Clarke has added another good UCI result to his palmares, with the Orica GreenEdge rider taking the overall classification in the the Jayco Herald Sun Tour. Clarke was set for a big battle on today’s final stage to the summit finish of Arthur’s Seat, knowing that his two closest rivals were just eight and eleven seconds back respectively. However the showdown between himself, Cameron Wurf (Cannondale Pro Cycling) and Jack Haig (Avanti Cycling Team) failed to materialise after the stage was called off due to potential danger. Police said that there was a big threat of bush fires and race organisers reluctantly had to take the decision to stop the event. That meant that Clarke picked up the first overall stage race success of his pro career and earmarked himself as a rider who should be worthy of consideration as a leader in some events. “I still get to stand on the podium,” he said today. “For us it is still a great win and we’re stoked to have been able to come away winning. Clarke grabbed the race lead when he won Friday’s second stage to Bendigo, deposing the previous day’s victor Nathan Haas (Garmin Sharp). He then defended his jersey on yesterday’s third stage, which was won by Robert John McCarthy (Jayco Australian Under 23). His success continues the strong debut of the Orica GreenEdge team, which will now head back to Europe and chase results there. Gerrans is hoping to once again win Milan Sanremo and will also push for other successes this year. However 27 year old Clarke is gaining in confidence and hopes to be given his own chances. “I’ve spent a lot of time supporting Gerro and the important thing for me is when I do get the opportunity to have a bit of free reign and go for myself, I make the most of that,” he stated. Jayco Herald Sun Tour race director John Trevorrow wanted to see the race reach its big crescendo on the final climb but accepted the necessity of the stage cancellation. “Whilst we are obviously disappointed that this great stage at Arthurs Seat could not go ahead, we understand the decision made by authorities,” he said. “It is a pretty dark day out there and the safety of the public state wide and our own riders and spectators is by far the priority. Clarke’s Orica GreenEdge squad was also the best team, while the twenty year old Thomas Hamilton (Jayco Australia U23 National Team) took the King of the Mountains jersey. His fellow Australian John Anderson (Drapac Professional Cycling) was the best sprinter and Jack Haig was the best young rider. Will Mohoric and Ewan to renew world championship rivalry at Jayco Herald Sun Tour?